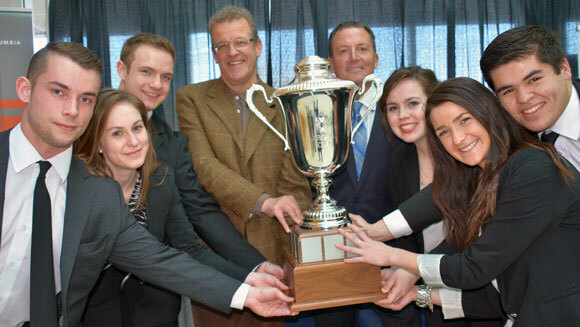 Winning team members of UBC’s Faculty of Management Live Case Competition, shown with the Argus Cup, are, from left: Branden Watt, Kaylin Westbrook, Russell Hoefsloot, Dean Roger Sugden, Argus Properties chief executive officer Ted Callahan, Kirsten Rancier, Keren Noy and Russel Jarvis. Callahan, CEO of Argus Properties, a privately owned Kelowna real estate investment company, which owns the Four Points Sheraton hotel, is donating $75,000 to the Faculty of Management over five years. The donation is in support of the faculty’s annual Live Case Competition. At the end of the Live Case Competition, Callahan awarded the winning team the "Argus Cup" and a $5,000 scholarship award. Both runner-up teams were awarded scholarships of $1,500. Three healthy living initiatives will launch in the Okanagan-Similkameen region thanks in part to the highly innovative efforts of students in the Faculty of Management at UBC’s Okanagan campus. Every April, more than 200 third-year management students participate in a class assignment called Live Case Challenge (LCC) where, in only two days, student groups tackle a real-world business-related challenge involving a local organization. This year, the Okanagan Similkameen Healthy Living Coalition (OSHLC) participated in the LCC by asking management students to produce a winning, viable solution to one of five assisted-living challenges around the theme of healthy living and chronic disease prevention. The student groups presented their ideas to a panel of judges from the Faculty of Management, the OSHLC, City of Penticton, Interior Health, and Regional District of Okanagan-Similkameen. The winners of the LCC challenge were management students Russell Hoefsloot, Russel Jarvis, Keren Noy, Kirsten Rancier, Branden Watt, and Kaylin Westbrook. “Our project was called Eat 2 Live and addressed childhood obesity within the Okanagan-Similkameen region,” says Noy. Eat 2 Live focuses on three themes -- grow, cook and inspire. The runner-up projects are also being implemented. One is called WIRED and addresses the City of Penticton’s initiative to involve teenagers and young adults in recreational activities. and partnering with local businesses. A WIRED membership card allows participants of the program to earn points for each activity involving the Penticton Community Centre. These points can be redeemed for coupons and other prizes. The WIRED website will allow participants to login with their Facebook account, where they keep track of points earned, sign up for classes at the Penticton Community Centre and see which friends are going. “We loved the idea and will be using components of the WIRED project to develop a collaborative initiative in partnership initially with School District 67 and the City of Penticton Recreation Department,” says Karr. The group plans to roll out the program in other communities as well as Penticton, collaborating with UBC and the work done by Keith Culver, director of UBC’s Okanagan Sustainability Institute, says Karr. The third student group receiving recognition at the LCC also chose to focus on the City of Penticton’s recreation initiative. The title of their project was Finding Balance, and aims to provide valuable life skills in nutrition, general wellness and physical activity to high school students about to leave home. The initiative uses “ambassadors” -- students from Okanagan College and UBC looking for summer work opportunities and ways to build their resumes -- to implement the programming. The plan also includes the implementation of workshops around physical activity and health and wellness in high schools.